The annual visit to our twinned village took place from 28 to 31 May when a group of 41 adults and young people made the journey to Verneuil-en-Halatte. Because of, as it turned out, the impossibility of booking a ferry or tunnel crossing at a reasonable hour on the first day of the half-term holidays (it would seem that the large coach companies must have block booked all the reservations) we arranged to travel to France by Eurostar for the first time. All went smoothly: our usual coach driver, Spike, took us in his coach to St Pancras, Eurostar departed on time for the journey of just 2¼ hours to Gare du Nord, then a local train to Creil, a couple of kilometres from Verneuil, where the Verneuil municipal coach picked us up for the last leg of the journey. Our hosts collected us from the parking area across the road from the cemetery; we learned that like Shelford change is afoot with new building work, and this will probably be the last year we use this car park as it is due to be developed shortly with a number of new houses. There was time for a welcome cup of tea before everyone reassembled in the canteen of the local primary school for a party. After the traditional welcome and thank-you speeches we were offered rum-punch aperitif, followed by a good buffet. Sunday was the day en famille. That weekend an enormous air show with a collection of old warplanes, e.g. Mirage, had been arranged at the local air base and a number of families went to watch although unfortunately the weather was bad with heavy cloud. Other families opted for a different activity, for example our hosts took us to Noyon, a town in the north of the Oise department, with a beautiful cathedral. On Monday we boarded the train again for Paris. It turned out to be one of the wettest days on record, just as the floods started! A metro ride took us to the Louvre where a walking tour around the area had been planned, however the weather had really closed in, and it was tipping down, so we splashed as quickly as possible across the open square and down a staircase into the basement underneath the Louvre where there is a huge shopping area and a welcome cup of coffee could be found. There are still the mediaeval foundations of a tower underneath, unfortunately impossible to access because of a very long queue. 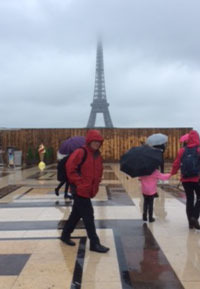 In the afternoon we made our way to the Seine, stopping at a wet but superb viewpoint of the Eiffel tower (although somewhat shrouded in cloud! ), and were treated to a trip on a bateau mouche with a full commentary on the buildings to be seen either side of the river. The evening was spent with our families. On Tuesday morning the plan originally was for the adults to visit the lovely mediaeval city of Senlis while the children of primary-school age spent the morning in the local school. However, with the threat of imminent local rail strikes starting that evening, we decided to play safe and took the first train into Paris. We divided into two groups, one going to the Musée d’Orsay, the other to the excellent science museum, Palais de la Découverte. We met up again at Gare du Nord to check into Eurostar for our journey back to London where we were collected by Spike in his coach for the final leg home. Although the outside activities were rain-washed, the welcome from our hosts was as chaleureux as ever, fulfilling for us the primary aim of our visits which is the continuing of our ties of friendship. We are now looking forward to welcoming a group from Verneuil here in early July.